Signing up for a club at Quad Rocks. The Office of Student Life is committed to empowering women to develop as leaders and individuals. On- and off-campus programs, resources and services benefit students and the larger community by fostering intellectual, ethical and personal growth. The office is also committed to supporting diversity and inclusion for all students. Students participate in more than 20 clubs and organizations that advance the co-curricular mission and enhance the liberal arts education. The office provides campus entertainment and social events and supports every aspect of student organizations. 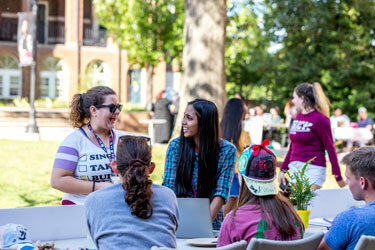 Each of these clubs and organizations provides an opportunity for Sweet Briar students to take on leadership roles at the College and put into practice what they’re learning in the classroom as part of the College’s leadership core curriculum. Leaders make change happen. They fearlessly take initiative, solve problems, and speak up for what’s right.